I am some what the typical bloke when it comes to the good old BBQ. I’m more than happy to supply friends and family with charred offerings but when it comes to cleaning the grill I’m gone. 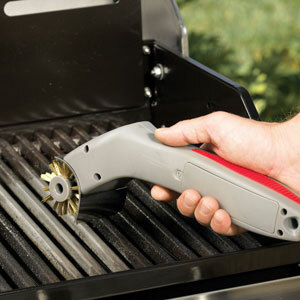 Then again if I had one of these that may be a different story, the motorized grill brush. I’m not sure how the gadget would cope with my ex-PC BBQ but it’s got to be easier than manual washing and probably a tad more hygienic than just burning the grime off as I normally do. You can get your own motorized grill brush from Brookstone for $25.00.